A unique dance program combines dance education & movement therapy to empower underserved girls in Madison. On a Saturday afternoon in early May, 75 excited schoolgirls took to the stage at historic Lathrop Hall on the University of Wisconsin–Madison campus to dance their hearts out. "I'm famous!" shouted a 10-year-old after her performance. This much-anticipated spring showcase is the annual punctuation mark on a unique 30-week dance outreach program called Performing Ourselves, taught by undergraduate dance students, funded by grants, and envisioned by university educators and accomplished dancers: Kate Corby and Mariah LeFeber. "Our goal is to empower and build the confidence of young girls, ages 5 to 14 from low-income families, who otherwise wouldn't have access to an afterschool dance program," says Corby, an award-winning choreographer and associate professor of dance in UW–Madison's School of Education. Corby explains her lightbulb moment for starting Performing Ourselves: "I volunteer for Big Brothers Big Sisters, and about six years ago I was helping my little sister register for afterschool activities. Her only options as a sixth-grade girl were tennis and wrestling. I thought that was absurd." Corby shared her vision to start a community dance program with colleague LeFeber, a then-adjunct professor in the dance department and board-certified dance/movement therapist. 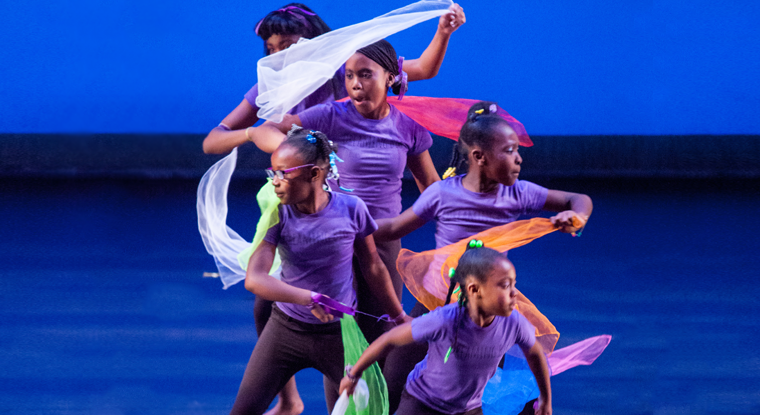 They decided to purposefully combine dance education and dance/movement therapy—which operates on the premise that motion and emotion are interconnected—to foster resilience in young girls. In May, 75 girls from Madison performed original dance numbers for Performing Ourselves’ spring showcase at Lathrop Hall. "We realized we would be the only ones in the country doing this," says Corby, who has contributed for eight years to the innovative nature of the UW–Madison Dance Department, founded in 1926 as the first university dance program in the U.S. In 2011, with a $1,500 grant from what is now Dane Arts, the two women started a pilot dance program for middle schoolers at Kennedy Heights Community Center, pioneering the combination of dance education and dance/movement therapy—with G-rated versions of popular music and a little hip hop thrown in, too, which Corby says is a real "hook" for their students. And it exploded from there. "We have never advertised our program. Community centers contact us, instead," says Corby. Now in its fourth year, Performing Ourselves' annual operating budget has leaped to $47,000, fully funded by private donations and grants, including a $6,000 award from the Wisconsin Center for Education Research. Today, the dance educators work with seven community partners in Madison—Boys & Girls Club of Dane County, Allied Learning Center, Vera Court Neighborhood Center, Inc. and the East Madison, Goodman, Kennedy Heights and Lussier Community Centers—serving nearly 100 schoolgirls, in first through 12th grades. Next year, they will expand the dance program into Madison schools, starting with Leopold Elementary School. What makes this program truly special are the teachers—currently, nine UW–Madison undergraduate dance students rigorously trained by Corby and LeFeber, who include cultural competency in the students' orientation. "They aren't just teaching dance skills. They also need to have an understanding of these kids' lives, as most of them live in poverty," Corby explains. For these undergraduates, Performing Ourselves offers a rare opportunity to teach dance—something that is not part of their degree program—and it has paid off nicely. "Everyone who has taught for us has gone on to teach dance in a nontraditional dance-studio setting," says LeFeber proudly. Performing Ourselves co-founders Mariah LeFeber (left) & Kate Corby thank the audience, performers and teachers at the annual dance recital. Take Flora Kim, for example. She graduated from UW–Madison in 2014 with a bachelor's degree in dance and taught for Performing Ourselves for two years. "I am so grateful for this program because it helped me discover that I had a real passion for teaching. I didn't even know I wanted to teach," says the 25-year-old alum, who is classically trained in ballet and specializes in modern dance. Kim now teaches dance professionally at Boston Ballet School. "Being part of Performing Ourselves gave me the experience I needed to land my current job as a dance teacher right out of school. It has really changed my life." Kim believes she may have helped change a few lives in the process, as well. She recalls an 11-year-old girl, Aisha, who came to her class every week. "When I first met her, she was very, very shy. But through the community that we created together in dance, I saw her come out of her shell and she eventually became the leader of the class." Kim adds, "The fact that I can be a positive influence and inspiration to young students, as a teacher, gives me great joy." On the north side of Madison at Kennedy Heights Community Center, girls ages 9 to 15 participate in the Performing Ourselves dance program once a week. "It is an invaluable afterschool program for these kids," says Jaimie Schlicher, a coordinator for the national nonprofit Girls Inc. "They get to be part of a free dance program right here in their own neighborhood, something they normally wouldn't be able to do because dance classes are very expensive." Schlicher adds that parents are grateful knowing that their daughters are safe, having fun and learning—and that the center provides a free dinner, too. She says the girls are especially happy that their dance mentor is a college student. "It gives them a chance to build connections with the university and with a dance major, who becomes a role model for them." LeFeber agrees that connecting these girls to the university can be life-changing. "When we bring the girls to the campus for the recital every year, the idea of pursuing higher education becomes something that is accessible to them." A dance undergraduate collaborates with students at Lussier Community Education Center for an original dance routine. Last year, LeFeber moved to Portland, Ore., but she flew back to Madison for the spring recital in May. "I watch these girls on performance day and I have a sense that this is my life's work," she shares tearfully. Though still very much involved with the running of Performing Ourselves, the mother of two works remotely with Corby, developing curriculum, training teachers via Skype, managing research and most important, writing grants. And securing grant money is key to keeping pace with the program's rapid growth. Next year's operating budget is projected to be $56,000. "So far, we've been able to meet all our operating costs with grants," says Corby. "Our dream would be that a donor comes to us and says, 'We love your work and want to start an endowment for you.' That would allow us to focus more on programming, rather than fundraising." As on point as Performing Ourselves is right now, the co-directors have even bigger plans. Next year, they hope to find an administrative home on campus, produce and publish a textbook about combining dance education with dance/movement therapy, raise student teacher wages to $15/hour and of course, secure more funding. "Eventually, we hope to start a chapter in Portland too," says Corby optimistically. "Somehow, we will make sure that this program that has empowered so many young girls will continue."